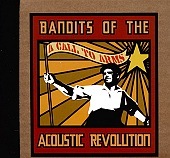 Bands of the Acoustic Revolution is not a band; they are a collective of New Jersey musicians. A revolving door of contributors who get together, jam, and create a very diverse collection of punk-fueled, poppy songs that travel the globe and implement ethic ingredients from a Spanish party flavor to rough, street rock all twisted around pop. The coolest thing about this it the unique packaging - A hand cut, stickered case with Velcro to close it. The music is pretty weak, but the package is beautiful. I would recommend buying this for the astonishing packaging. I'll give this a C.